All species of sea turtles are endangered: and none more than the Kemp’s Ridley. Our state park guide Bryan Frazier was on South Padre Island recently and witnessed the release of some Kemp’s hatchlings. 54— Sea Turtle, Inc., which is a partner with TPW and the National Park service..they do such fantastic down on South Padre Island and the Gulf of Mexico in rescuing, rehabilitating and releasing sea turtles back into the wild. 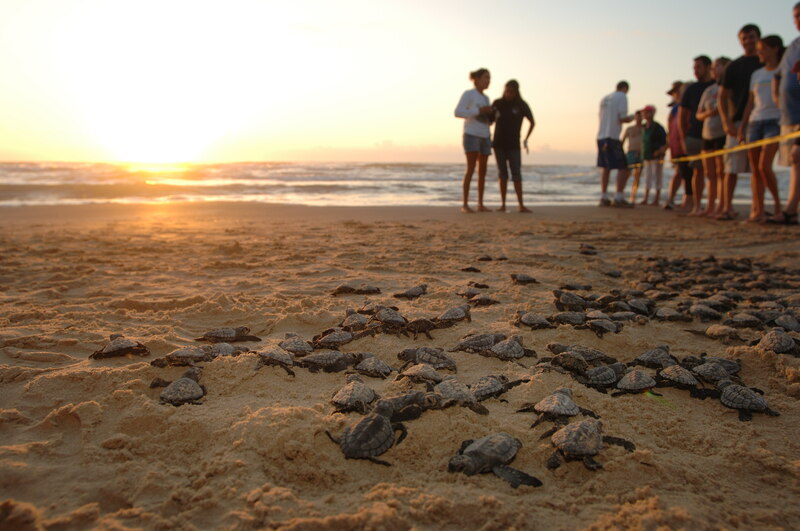 And while I was down there on vacation they just happened to be having a hatchling release: 89 baby Kemp’s Ridley sea turtles, which are critically endangered. And I got to photograph that release back into the Gulf of Mexico. It was a profound experience. The whole summertime is the time when those hatchlings come out of the eggs and are released back into the Gulf, and so it’s still a time to do that, and they’re open to the public. If people will visit Sea Turtle, Inc. Like them on Facebook, or call them while they’re down there on South Padre island, they can witness this as well. And the work that’s going on there is impacting things all the way down into the interior of Mexico and the Mexican coast. Follow them and us on Facebook and see the incredible story that the sea turtles have to tell, and how relevant that is to all of our efforts here in Texas. That’s our show for today…with funding provided by Chevrolet, supporting outdoor recreation in Texas; because there’s life to be done. For Texas Parks and Wildlife I’m Cecilia Nasti. This entry was posted on Monday, August 13th, 2012 at 12:00 am	and is filed under Endangered, Wildlife. You can follow any responses to this entry through the RSS 2.0 feed. You can leave a response, or trackback from your own site.